The firm is increasing its ability to originate loans in quicker and quicker time periods. 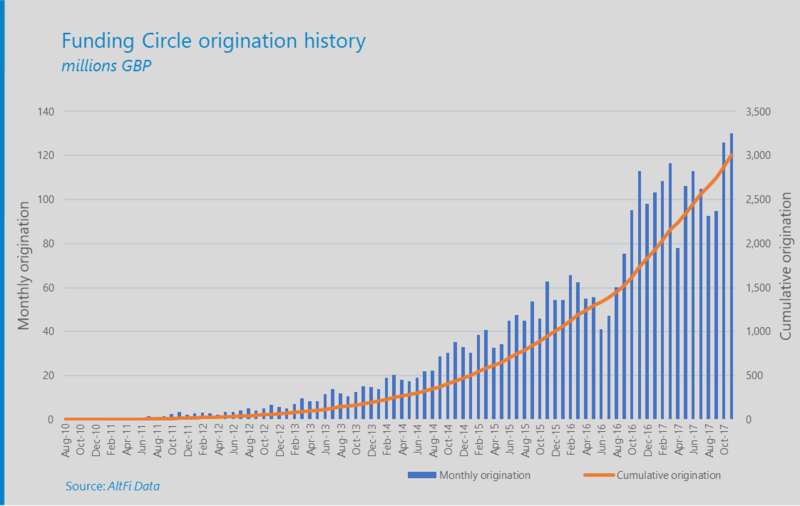 Funding Circle has secured its place as the largest UK peer-to-peer lender passing £3bn of loan origination, according to AltFi Data. The platform’s UK lending business crossed the threshold over the weekend following a strong week and a broader uptick in recent months, as shown in the graph below. As a sign of its increasing deployment potential, it went from 0 to £1bn in loans between launching in August 2010 and January 2016, when it passed the £1bn milestone. It took just 13 months to reach the £2bn milestone back in February 2017, meaning it took less than 10 months to lend out the most recent £1bn. The milestone has also coincided, almost to the day, with the launch of the firm’s ISA offering which went live last week as well as longer term high demand for its investment trust, the Funding Circle SME Income fund, which has grown to more than £300m of assets following a C share issuance in April. The portfolio sits on a 1.9 per cent premium at present. Funding Circle also signed a landmark deal in August with Aegon, one of the world’s largest providers of life insurance, pensions and asset management. Aegon will fund £160m of loans in the first 12 months of the agreement, with the aim of extending the deal steadily across a four-year programme. The SME lender, which has other operations in the US, Netherlands and Germany lost £35.7m in 2016, slightly down from £36.9m in the previous year. The platform boosted revenues, however, by 59 per cent to £50.9m, and saw its total loans outstanding climb 61 per cent to £1.37bn.